Download Interstellar in Digital HD from the iTunes store. Interstellar images are © Paramount Pictures. All Rights Reserved. 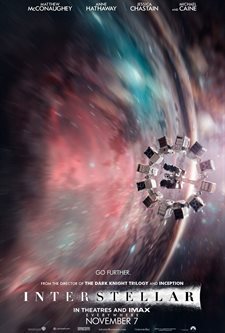 How to make a movie 101 – Open up a proverbial can and add a little bit of 2001: A Space Odyssey, a star studded cast, a bit of family conflict, a three hour runtime, and a horrible twist, and you have Interstellar. Interstellar, the latest big budget, big concept film from Christopher Nolan (Inception, The Dark Knight), written by his brother Jonathan Nolan (The Prestige, The Dark Knight Rises) is a high concept film about how the earth has run out of available food due to overpopulation. Instead of students studying to be engineers or businessmen (which this world can use less of anyway), they are guided towards the profession of farming. Enter former NASA engineer/pilot now farmer, Cooper (Matthew McConaughey; Mud, Dallas Buyers Club), who just won't accept life the way it is, just so happens to find a secret government NASA installation and books a ticket as a space shuttle pilot to help save the human species from extinction. However, to do this, he must leave behind his "mini-me" daughter Murph played by Mackenzie Foy (Twilight Saga: Breaking Dawn) and Jessica Chastain (Zero Dark Thirty) his son Tom played by Timothée Chalamet (Homeland) and Casey Affleck (Ocean's Eleven) to be raised by their grandfather, Donald, (John Lithgow; Dexter, Cliffhanger) since Cooper will be gone for an unknown amount of time. After the first hour of exposition and setting up the film, Nolan proceeds to have the "Lazarus" crew launch into space to try to find a new home for the human population. During this part of the film, Nolan tried to mix in some "pseudoscience" into the film during the breath-taking visual effects displayed on screen. While on their wild ride, our crew travels through wormholes and lands on planets where time is not the same as the rest of the universe. Throughout the film, life is still shown on earth through various ways that push the story along. The final act of this three-hour symphony borders on the ridiculous, throwing "pseudoscience" out the window and goes for a very large leap of faith by the audience. The film does a tail spin into mediocrity leaving the jaw clenching moments of the second act behind to be replaced by disappointment until the film draws to a close. While Christopher Nolan has had a film career that can be rivaled only by Marvel and Pixar, he truly has his second failure here (first being Insomnia). The film is so large in scope that only the small details work, such as the intimate relationship between young Murph and Cooper. Those few moments in the first act of the film had me thinking about my own family relationships. Even the comradery between Cooper and crew members. Anne Hathaway (The Dark Knight Rises, Les Misérables ) Jeffery Wright (The Hunger Games, Casino Royale), Tars (HAL 2.0) had a some great moments and scenes. However, with all of the special effects, the great emotional parts of the story, and the amazing Hans Zimmer soundtrack, nothing will work if the three act film falls flat on its story. Maybe Christopher Nolan should have taken a second thought about picking up the reigns of this film when one of the greats himself, Stephen Spielberg (Jaw, Raiders of The Lost Ark), left the project. Here's hoping he rights his path soon and gives us something truly worthy of his genius. Cast and director is enough reason to see this. watched a couple of the trailers and was blown away, so the movie must be epic! christopher nolan knows his s***!